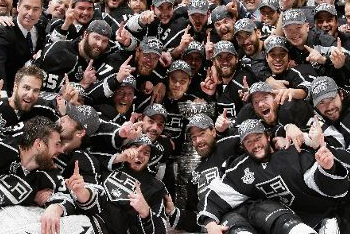 The Los Angeles Kings are the new Stanley Cup Champions defeating the New Jersey Devils in 6 games with a 6-1 win. 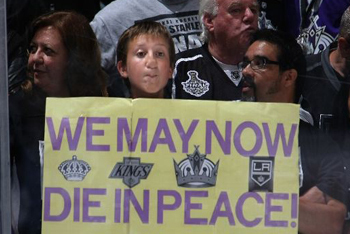 The Kings' overall record was 16-4, the 2nd best finish by any NHL team ever. Pretty good for a team that has never won a Stanley Cup in their 45-year existence. In the very first period, Devil's forward Steve Bernier received a 5-minute major penalty for his boarding body check and the Kings scored 3 times on that power-play. The Devils had to change their defensive game plan to an offensive one and the Kings provided a quick counterattack to everything. Checkmate Kings! Jonathon Quick was definitely the best player of the playoffs allowing only 1.41 goals in only 20 playoff games. And let’s all agree that he has the greatest name for any sports player ever. 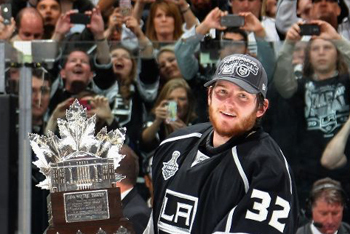 Jonathon won the Conn Smythe Trophy, the award for the most valuable player in the NHL Playoffs . 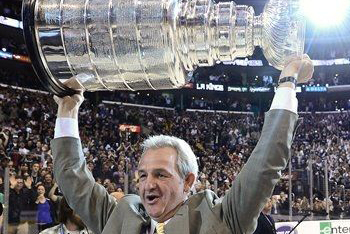 The Kings strategy started in December when they hired Darryl Sutter, their new coach. Darryl managed to help the Kings just barely get into the playoffs, as they were the last team to qualify for the 8th and final playoff spot. After that, winning the Stanley Cup seemed pretty easy for the Kings as they cruised behind their defense and goaltending. Are you happy the LA Kings won? Who will you be cheering for next season? What Was The First Hockey Puck Made From? A piece of frozen cow crap.